You’ve loved dogs all your life so you decide to start a dog breeding and training business. 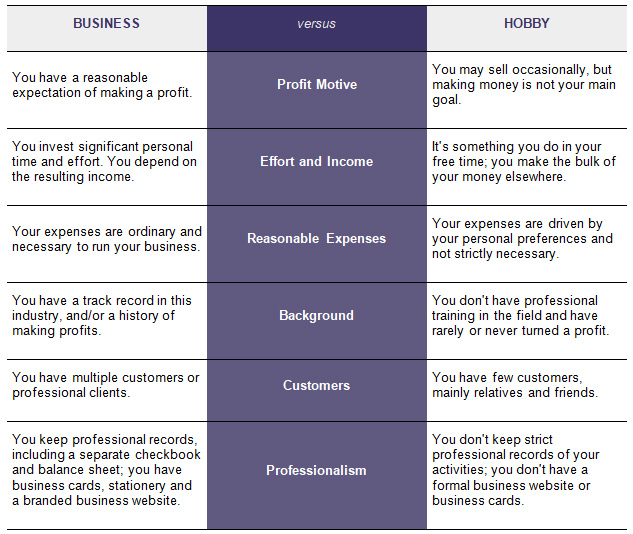 Turning your hobby into a business can provide tax benefits if you do it right. But it can create a big tax headache if you do it wrong. One of the main benefits of turning your hobby into a business is deducting all your qualified business expenses, even if it results in a loss. However, if you don’t properly transition your hobby into a business in the eyes of the IRS, you could be waving a red flag that reads, “Audit Me!” The agency uses several criteria to distinguish whether an activity is a hobby or a business. If your dog breeding business (or any other activity) falls under any of the “hobby” categories on the right side of the chart, consider what you can do to meet the businesslike criteria on the left side. The more your activity resembles the left side, the less likely you are to be challenged by the IRS. If you need help to ensure you meet the IRS’s criteria for businesslike activity, reach out to schedule an appointment.